Most of the brilliant arts and cultural activities in Peterborough take place in the city centre. We realise that not everyone has the ability or desire to travel into town to go to events or take part in creative stuff. 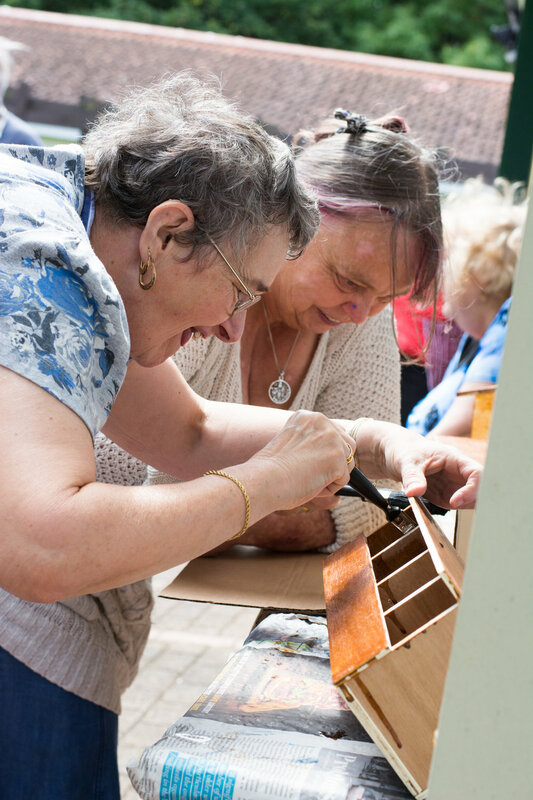 Our aim is to bring great art and creative to the doorstep of Bretton, working with local people and organisations to create things to do in the area that are relevant to what local people want to see. You can read more about our artistic vision for Bretton here. We love the patches of greenery and open space hidden amongst the Bretton houses. It’s pretty unique to be able to step out of your house and into some ancient woodland! In 2017, our first project in the area, Bretton Greens, got us thinking about some of these overlooked spaces in creative new ways. Bretton Greens began with a series of creative walks such as poetry walks, photo walks, smell walks and bird walks. In the second stage, workshops were held for residents to design objects and artworks that could be used to brighten the areas. 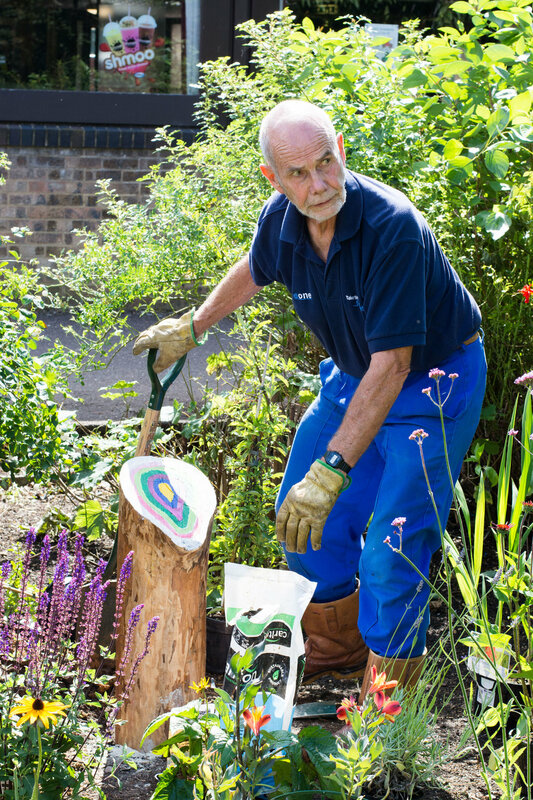 The wider community voted for their favourite designs at Bretton Festival 2017 and three were selected: a mural at the site of the former paddling pool, a small community garden near the Pyramid Centre, and an installation of bird boxes at the local primary school. The winning designs were then created and installed with the community. The final stage of the project was an illustrated map which highlighted the three pieces of art alongside information on local groups and snippets of poems created. 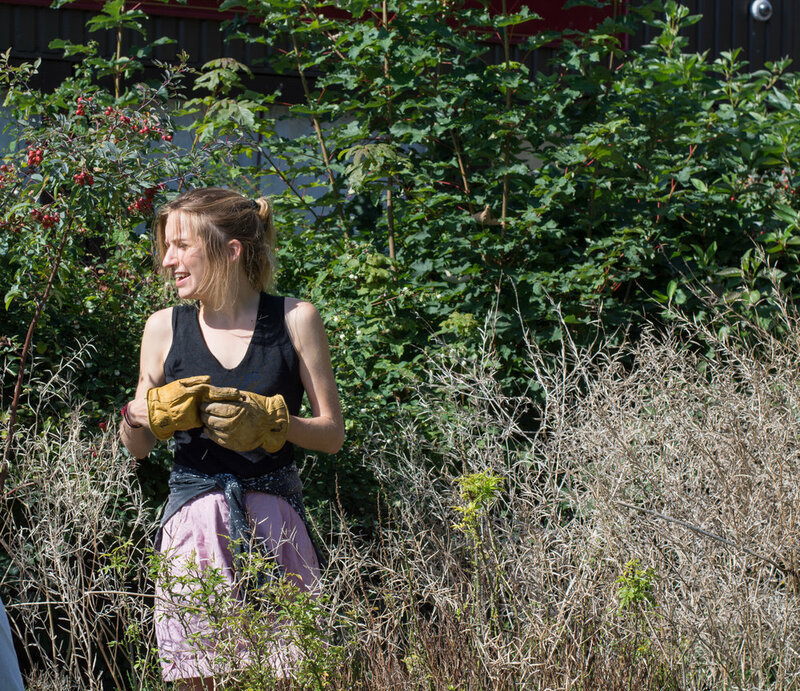 Read more about the project and working with Katy over on our blog. Bretton Parish Council has run Bretton Community Festival for more than 30 years and it has always been a fun filled day with stalls, food, fair ground rides, and musical entertainment. We’ve always felt very welcome at the festival, and since 2017 we’ve been able to bring our ‘arts zone’ to the festival. 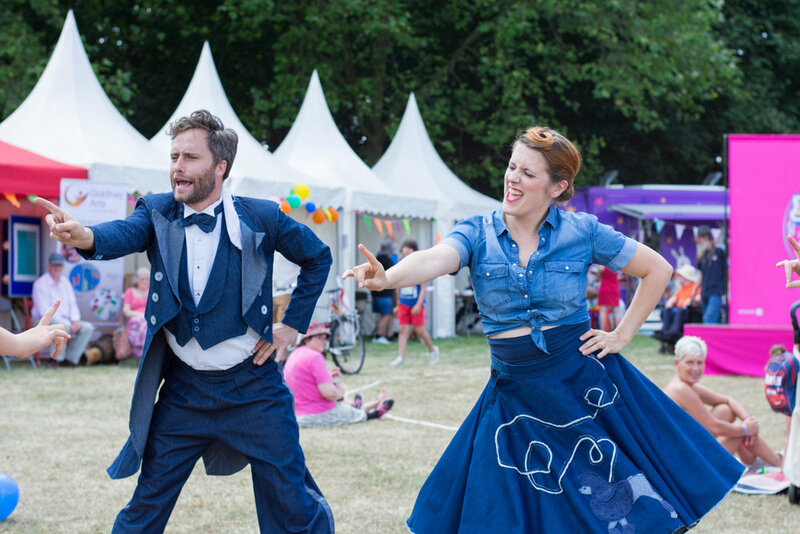 Highlights have included a digital illusion Anti-Gravity Box, a graffiti wall, a ‘maker’s market’ of local crafts, street theatre to get you dancing, and music headliners including folk star Elliott Morris. Make sure you check out our what’s on page to find out our plans for this year! We have been working with Better Bretton since 2017. Along the way we’ve made great friends with the members of the older people’s network, who have been incredibly helpful and inspiring to work with. 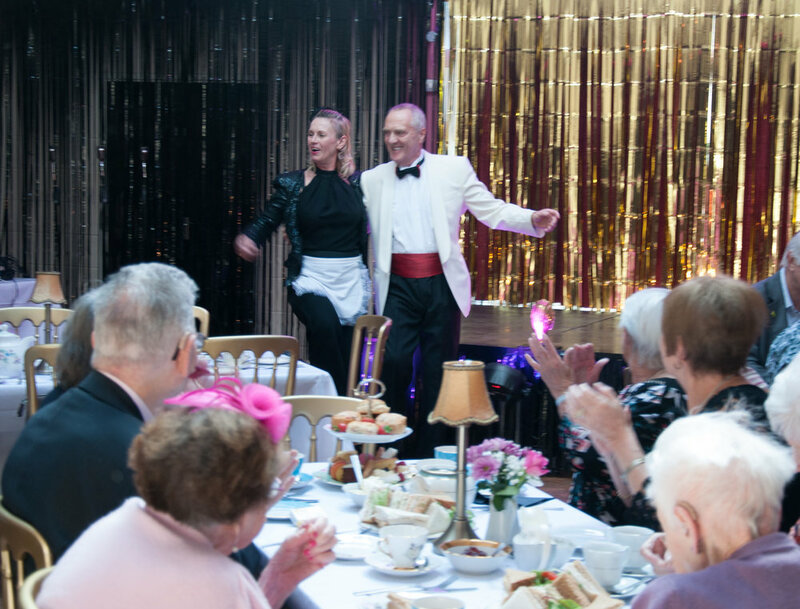 Some of our projects have been exclusively for older people, such as Posh Club, which was a glitzy cabaret lunchtime show for people in their 50s, 60s, 70s, 80s, 90s, & 100s. We have also spent the first part of 2019 working with Eastern Angles and Blossom Court to create Bretton’s very own sold-out panto! We think this community centre is a hidden gem! Multiple rooms, easy access, and a mirror ball in the ceiling… what’s not to love?? Bernard and his team at Bretton Parish Council have opened their doors for us for lots of our activities from Bretton Family Film Club to The Posh Club to our most recent ‘Under the Surface’ poster making workshops. Next time you pop in see if you spot the poems and photos on display written by local poets! With over 3000 members, the community are really active on Facebook, posting regularly about all kinds of topics, both the good and the bad! We’ve found that the Bretton Community Facebook group is a great way to find out what’s going on in the area, meet people who might be interested in what we do, what local issues and projects people are interested in, and to share updates about our own activities in the area. If you’re from Bretton and not already a member, we recommend signing up. Another stallholder announcement for Bretton Festival Makers Market! Find out about Goldhay Arts and the session they will be running for the Makers Market. 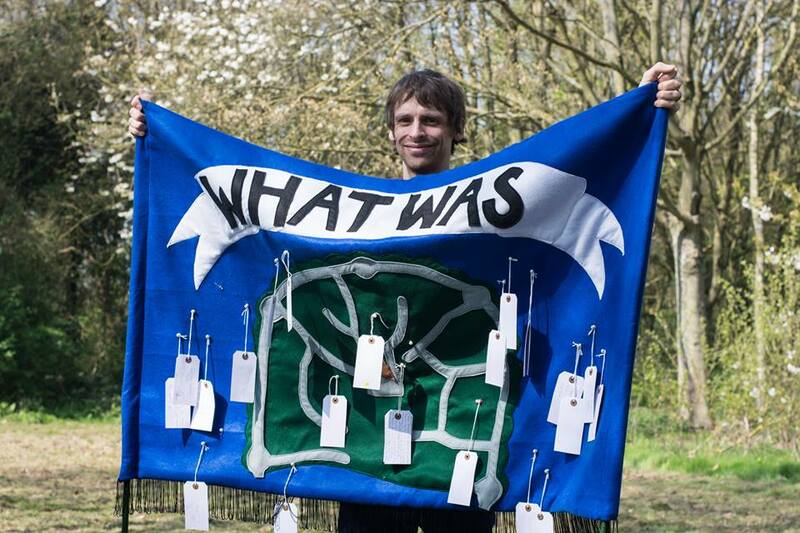 Bretton Festival Makers Market Stallholder Announcement! Peterborough Presents wants you to share your skills with us at Bretton Festival! Join our Bretton Festival 2018 Festival Panel Team! Do you live in Bretton? Want to be involved in our upcoming projects? Fill out the expression of interest form and someone from Peterborough Presents will be in touch soon!